Ohrid is, whatever else might be said, the crown of the Macedonian experience. An image emporium, in which nature, culture, tradition and tranquility are intertwined in order to offer something so rich and colorful like you never experienced before. And whereas attractive holiday locations are kept alive due to somewhat of a loud lip service, what is said about Ohrid touches only the proverbial tip of the iceberg of what this city really has to offer. Known as Jerusalem of the Balkans, for the fact that it once had 365 churches, and offering impeccable nature that will dry out the memory card of your camera, visiting Ohrid will change whatever definition you had up until now about what makes for a perfect holiday. Ohrid is part of the UNESCO world heritage, and the fact that it is protected both as a cultural and nature heritage, points to far more colorful of a destination. By extension, despite offering a rich garden variety of churches, galleries, ancient sites, sandy beaches and crisp water, this city will allow you to indulge into a memorable gastronomic experience, as well as multitude of activities which explore the outdoors. Located in the far south-west of Macedonia and being close only to Struga and nearby villages, Ohrid offers the convenience of having an airport. It is not a very long drive from Skopje anyway, and can be combined as part of a Skopje-Mavrovo-Ohrid tour, but even if you decide to visit Ohrid alone it can offer a boatload (hey, no pun intended) all by itself. And if you thought, even for a moment, that having that entire cultural heritage it shifts irresistibly away from a dynamic city and night life, you are far by a longshot. These monuments of ancient time, culture and tradition, serve as places where events take place, lots of people, young and old alike gather. If you bet your guess on churches, it is right, there are so many of them to visit that you are certainly going to miss most. Anyway, visiting couple of them is enough to show you why this city is known as the Jerusalem of the Balkans. The ancient theatre, one of three such sites in Macedonia, is the only one from the Helenic period. In context to what I wrote above, it does also serve as a place where art and culture take place, mostly during the summer. The value of cultural heritage is confined not only to brick-and-mortar monuments and sites. Much can be appreciated from the inside of a gallery, especially the icon gallery, where the collection ranks second only to the one in Moscow. Ohrid, as it is, represents a gallery to Christianity- Maybe amongst the most marvelous ones that the world has ever seen. The Pantelejmon monastery, known as Plaoshnik, located somewhat upward and away from the center, can be found at the back of many postcards and is really a place you should visit and take pictures from. Partially secluded, the church itself along with the surrounding forest will provide for a nice touch of tranquility. Now a place offering peace of mind, it was actually one of the oldest Universities in the western world, dating before the 10th century. Kaneo though, a quaintly archaic church overlooking the lake from atop of a rocky shore, is a place you definitely should visit. Most panoramic pictures of Lake Ohrid are taken from here. The beach below, along with the restaurant, can offer a really nice relaxation from the daily tour, so I always advise to visit Kaneo as your last item before noon. Stay there till the sun gives up, and head straight for the city. The Samuel Fortress should be next on your list, since it is one of Ohrid’s landmarks. Build by the Tsar Samuel while Ohrid was his capitol for a brief period of time, it gives this city an even bigger diversity. Ohrid offers a lot of traditional architecture, and it blends in perfectly with all the monuments of history. The peculiar houses characteristic only for this region, make the streets of the city more colorful, more dynamic, more out of the ordinary surroundings our eyes are used to see. They stand true to history and culture, for it is a city which albeit adopting modern and new, still refuses to give away itself completely to change. And while Ohrid is so full with diversity that you can never run out of places to visit, the surroundings offer en equally astonishing spectrum of sites and monuments, both to history and nature. The monastery of Saint Naum, a complex 25 kilometers away from the center of the city, commands much attention. If you fail to pay a visit, it is just as if you never were to Ohrid at all. Tranquility, a rich monument to history and religion, and a place so intertwined with nature and beautiful sites that makes one to really want to stay for a while. What makes this visit even more memorable is the row boat ride from the city to the monastery across the lake. If you take this tour however, my recommendation is to further extend it by going to the springs of Lake Ohrid as well. Picturesque, tranquil just like being taken out of a wood-elf story, these springs run with very cold water, so crisp you might think it is as shallow as to be able to stand, when in fact the water is many tens of meters deep. The temperature of the water is so low due to the fact that these springs flow below the Galicica Mountain, carrying water into Lake Ohrid directly from Lake Prespa- an interesting phenomenon of nature. Velgosti, once a separate village, is now one of the suburbs of Ohrid, but you can still see and feel the unique traditional way of life in this region. Positioned at the foot of East Mountain, this village provides an opportunity to explore the mountain area, and savor the rural life of its inhabitants such as shepherds, their cuisine and the beauty of the typical rural way of life cultivated for many years. Above the village, the monastery of St. Petka provides accommodation all year round in a tranquil environment with a beautiful view. Further up the mountain are the churches of St. Ilija and St. Nikola. In these temples time has left rare marks of the significance of people’s faith even in the most difficult times. If you are looking for quiet village life, beautiful lake views and unspoiled natural beauty visit Elshani. Traditional life goes on here as if time has stood still. Each family has its own vineyard, animals are still kept and traditional processes such as the distillation of rakija are still practiced. Woodcarvers and coopers still pursue their trades too. The Bay of Bones, a museum on water I really recommend you to visit, is an exceptional archaeological complex, which is one of a kind in the region. Erected as a pile-dwelling settlement on the southern coast of Gradiste Peninsula it is an authentic reconstruction of a part of the pile-dwelling settlement, dating back between 1200 and 700 BC which in the past was spreading at a total surface of 8.500 m2. If culture however is not your weak spot, the National Park Galicica will dwarf everything else in significance. A mountainous region, offering a plethora of hiking and biking trails as well as many hills and grassy pastures, it is a heaven-on-earth for outdoor aficionados. You think visiting cultural monuments one after another might bore you? – go and take a tandem paragliding flight and see Ohrid and all its riches from above then. The trekking trail Asan Dzura is situated in the central part of the National park and it is 15 km long. If nothing else, start from there and walk your way to the top of Mountain Galicica where you will be able to see Lake Ohrid from your west, and Lake Prespa from your east- a rare sight worth every step of the climb. The cave Samatska Dupka is 224 m long, 6 m wide and the ceiling is 2 to 10 m high. Go visit it as well in order to enrich your experience. Late summer offers another attraction as well, when on the second of August Ohrid becomes home to one of the world’s most famous swimming marathons on open waters. 30 Kilometers long, this race attracts the best in the world in this discipline, and is considered to be an elite competition. The lake offers one big event more, when in January thousands of people gather in order to attend the tradition of catching the holy cross. This is in memory of the day Jesus was baptized. The water is blessed by the priest and a cross is thrown into the water. People then rush into the water to catch the cross. Whoever gets the cross is believed to have a very exciting year coming up. Since Epiphany always takes place in winter, catching the cross in the water is usually done by young people. Interestingly enough, as cold as it may be outside, there has not been a case of a person that got into the blessed water of getting ill. Some of the blessed water is taken home in small containers as a symbol of purity and protection from illness, and is kept near the family icon. If you want to satisfy your cultural cravings, map a tour of all the churches and monuments you want to visit, and it will buy you a lot of foot work while you are staying. Crab a taxi if you will, since they are fairly cheap, but always insist for the meter to be switched on- citizens live off tourists, and taxi drivers have a reputation, earned or not, to charge foreigners somewhat different prices. The city is not that big anyway, so a short walk from one place to another will only make it way more interesting and exciting. If you by chance happen to visit during the month of August when the Ohrid summer festival takes place, and if you are into classical music, drama and theatre, this might turn into an unforgettable experience. Renowned artists from all over the world has attended and will hopefully continue to do so. Enjoy the beaches as well, for sandy and with crisp water as they are it is a crime not to go sunbathing. Water sports, fishing, boating, cliff jumping from heights that command respect… the lake can accommodate all whims and wishes. 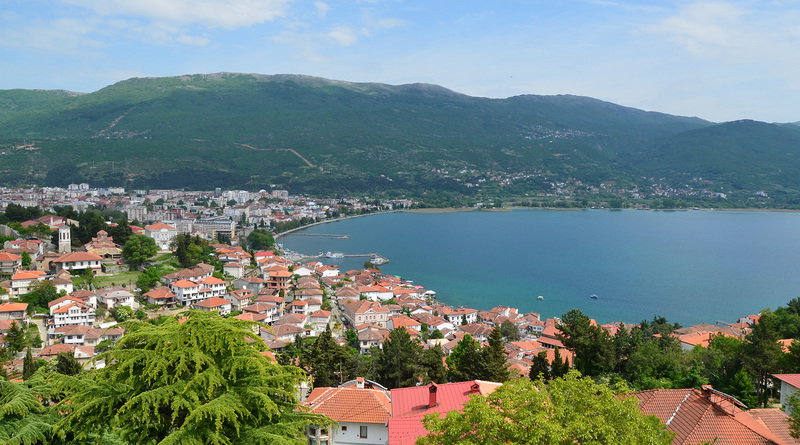 Ljubanishta is a lovely beach and some consider it to be the best Ohrid has to offer. I disagree though, since albeit it is sandy and very long, many nearby villages such as Trpejca have many secluded beaches where you pay a row boat to take you there and come back at arranged hours. Trpejca also has excellent places where you can eat and enjoy the view of the lake. And while we are discussing about relaxing with food while enjoying the sight of the lake, Dalga restaurant offers a unique experience with a terrace over the lake in the old part of town. Eat, go out at night, have fun, visit all the churches and sites you can, drop by at concerts and cultural events, enjoy the beaches and outdoor sports… Ohrid can offer an unforgettable experience and make you want to stay for more and more and more. Come and have the holiday of your life while witnessing the blend of culture and tradition, nature, tasty food, wine, and lots of fun.